AddString: use it to... add a string. 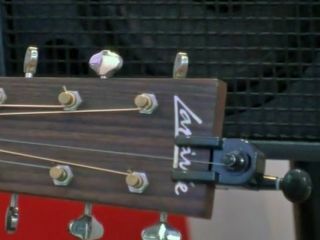 MUSIKMESSE 2012: One of the more intriguing guitar products in Frankfurt this year is AddString, an innovative new accessory that enables you to fit an extra steel string to your acoustic guitar. Why would you want to do this? Well, Martin's HD7 Roger McGuinn signature acoustic includes a seventh octave G string which captures some of the chime and jangle of a 12-string without the associated tuning issues from which most 12-strings suffer. The interesting thing about the AddString is that it allows you to add an octave G to almost any steel-string acoustic without drilling or serious modification, and also includes a clever way to clip the additional seventh string out of the way when it isn't required. Inventor Harald Gillis explains how it all works in our video, but our first impressions after a few minutes of use is that AddString works very well indeed. AddString doesn't look too intrusive and the only permanent modification required is to cut a shallow, barely visible groove in your guitar's nut to accommodate the extra string. There's even a handy tool included in the kit to help you do this. Sonically, the octave G brings a genuine 12-string character to proceedings, and it's a genuinely pretty tone with a real flavour of 1970s Americana.